The scene of the attack was sealed off this morning. TWO MEN WERE stabbed by a third man who struck up a conversation with them in Dublin late last night. The incident happened on Blessington Street on the corner with Dorset Street. 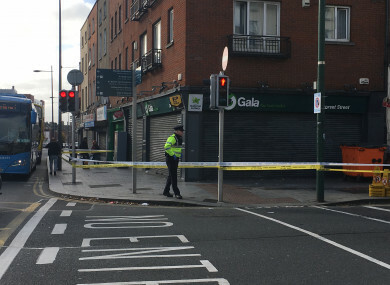 The scene outside the Gala store was sealed off by gardaí this morning with a large amount of blood still visible on the pavement. Gardaí say the incident happened at about 1 am this morning when two men, a 36-year-old and a 38-year-old, were approached by a third man. The third man struck up a conversation with the two before attacking them and leaving them with stab wounds. The men were stabbed in the abdomen and were treated at the scene before being taken to the nearby Mater Hospital. Their injuries are not thought to be life-threatening. An investigation has been launched by gardaí at Mountjoy Garda Station. Email “Two men stabbed after being approached on Dublin street by man who chatted to them”. Feedback on “Two men stabbed after being approached on Dublin street by man who chatted to them”.